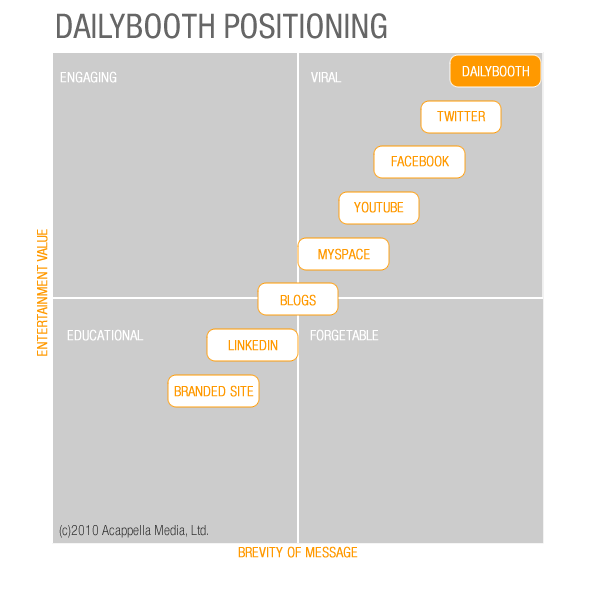 Is Dailybooth the next Twitter? Remember when @mrskutcher only had 28,784 followers on Twitter? Neither do I. But that’s the point about Dailybooth.com! It’s like the wild west all over again in that it completely levels the playing field. Everyone starts at 0 followers. THIS is your second chance to connect with the people on Twitter you follow who have hundreds of thousands (or millions @MrsKutcher) of followers. If you’re lucky, they’ll have only…say…72 followers on Dailybooth like @Adventuregirl who has 1,494,734 on twitter! Spark a dialogue with your favorite Twitter peeps BEFORE they reach the same number of followers. Who knows, maybe you’ll get a follow back on Twitter and some link love, right @adventuregirl ? (call me < cheesy wink>). I first heard of Dailybooth during the TechCrunch Disrupt in March 2010. Back then, I signed up a poked around but didn’t get hooked until recently. Here’s the gist: remember how much fun you used to have jumping in to a photo booth and snapping some goofy shots with your pals/girlfriends? You’d then show off the snaps to your friends or put them in your locker for others to see? Well now imagine doing that with the web as your locker. When Twitter first launched they were educating users to “tell us what you’re doing” when in reality we were using it to tell people what we’re THINKING! Dailybooth, in contrast, is “SHOW us what you’re doing”. But the real fun and audience engagement comes with the replies. You’re not just writing a reply, you are “miming” your reply in a photo response. Following some of these streams can be absolutely addicting and hilarious!!! Making new friends and exploring is easy. Follow the live stream and start connecting with people that seam interesting but don’t be “that creepy person”!!! Just like in the early years of Facebook, Dailybooth is a really younger demographic. I mean REALLY young. Not sure of the policy is on minimum age, but you almost feel like a perv at first. As a dad of two young daughters some of the provocative poses (though PG-rated) may be a bit awkward and even unsettling. But I felt better after seeing some real celebs more my age and the following they’ve developed and how it really is a GREAT experience and a fantastic way to express your creativity and individuality. So, sorry kids! Here come your parents and aunts and uncles to ruein the party. And up next….<insert horror music and scream> the ADVERTISERS!! Advertising! Marketing! That’s why I’m writing about it today. Dailybooth is a hidden gem just like the Twitter in the early days where you can still have the first mover advantage. What makes Dailybooth so interesting is that it’s incredibly quick and easy (you’d be amazed at how I agonize over carefully choosing my 140 characters)! You just sit in front of your web cam and snap away (or upload), type as little as a one-word comment and pick sharing options of Twitter and/or Facebook or what I like to call the photo-mojo. Compared to the other popular social media sites, Dailybooth is pure entertainment and the easiest to create content which means there will be a ton of content and it will be very entertaining and easy to go viral. It really is positioned nicely among the other social media sites (see below). 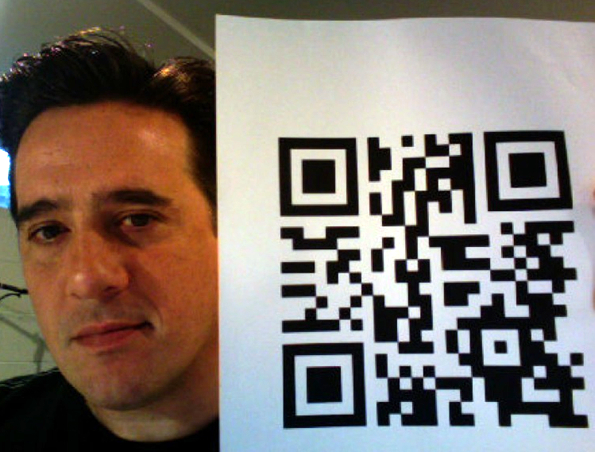 Get people to show you some love using using QR Codes! You can cross promote to other sites like this! Studies have shown that people LOVE to brag about their latest shopping finds. Get them to snap a photo with your product and post on Dailybooth then reward them with coupons or discounts. Just get the ball rolling with a few simple rules and the crowds take over. Don’t forget, “boothers” are not tethered to their desktops! Theres an iPhone app and you can also email photos to your profile. So get them engaged in activities and interacting with your brand at your location or get them to put lampshades on their heads at your events. Set up a Dailybooth BOOTH at the event and let the frenzy begin! These are just a couple of ideas. So what do you think? 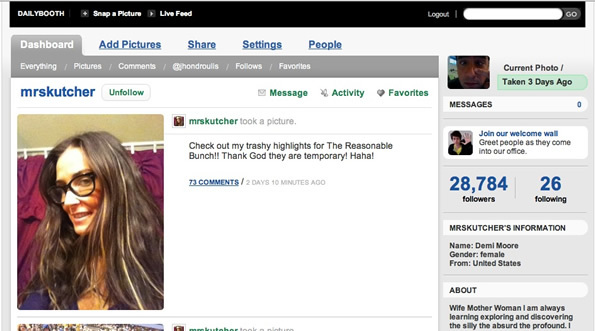 Will Dailybooth become as big as Twitter? Posted on September 15, 2010 June 8, 2017 Author Categories Best Practices, Digital Strategy, Social MediaTags dailyboothLeave a comment on Is Dailybooth the next Twitter?